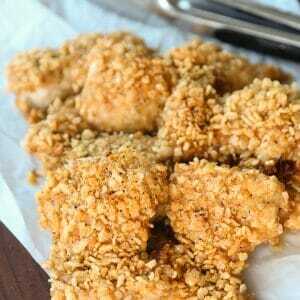 A delicious and simple recipe with tender juicy chicken and a buttery-crisp topping! Pat chicken dry and use a clean pair of kitchen shears (or a pair of regular scissors that’s been washed with soap and hot water- just pop them in the dishwasher after!) to trim off any excess fat. Melt butter in a shallow dish. Pour several cups of rice krispy cereal in a separate dish. Use your hands to very lightly crush the cereal just a few times. Dip each chicken piece in butter on both sides and then dip the top side in the cereal. Use your had to press a little more cereal onto the top and then place on a baking sheet. When all chicken pieces have been placed on the baking sheet, sprinkle all pieces with each spice (seasoning salt, lemon pepper, garlic powder, and onion powder.) If there is any extra butter in your dish you can gently drizzle it over the chicken. Bake for 20-30 minutes, until the chicken reaches an internal temperature of 165 and also the cereal is golden brown and crisp. You can make as much or as little chicken as you like! I included measurements on the chicken and butter so you know that I usually use 1 stick per about 8 thighs. When it comes to the cereal and seasonings, it’s not hard to eyeball and the exact amount will vary depending on the size of your chicken pieces.